Even though Diwali is finished by giving lights to our life, we are still living with the aftermath of the celebrations. Diwali is the time to play free online rummy card games online, and enjoy the maximum. Ace2Three knows that they needed to host tourneys that stand out from the crowd. This is why they have decided to bring awesome celebrations to the table by hosting Diwali tournaments. If you love playing tournaments at Ace2Three, you can win from a total prize pool of Rs.1 Crore this Diwali by winning the special tourneys. 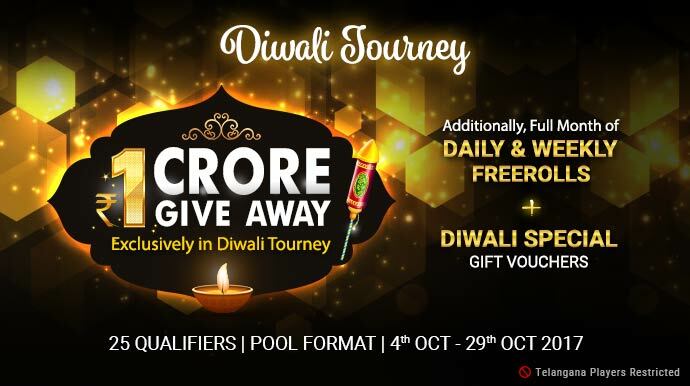 The one crore giveaway tourney is designed for the players who like to make it big this Diwali. You have the opportunity to participate in the daily qualifiers for just Rs.10 to win an entry ticket to the final event. The most attractive thing about the Diwali tourney is that the first prize is a whopping Rs.13,15,699!! So, if you are game to participate in the special Diwali tourney, start participating in the daily tourneys. The Diwali tournament qualifiers will be live from 4th October 2017 to 27th October at 10:00 PM. You can enter the qualifiers with Rs.10. There will be a maximum of 400 winners who can get hold of the entry ticket to the final event and win from the prize pool of Rs. 79,600. Please find the details of the tourney in the table below. There will be multiple finals in the Diwali tourney. Please find the details of the final tournament in the table below. So, head straight to Ace2Three and start playing rummy today and win from the whopping prize pool. Please do let us know how the special tourney went for you!